Asya Eutykh is the seamstress of gold and the gunsmith woman-master from Adygea. People justifiably name her ‘Golden-armed’. She is one of the few gunsmith women-masters from Caucasus that reveals the ancient secrets of silver molding, blackening and gilding. Her unique masterpieces in the style of Maykop culture decorate collections of such well known people as: King Hussein of Jordan, former President of Egypt Hosni Mubarak and his spouse, Muammar Gaddafi, Arabian Sheikh of Ras al-Heim (United Arab Emirates), Khalid bin Saqr Al Qasimi, Vagit Alekperov, Yury Luzhkov and many others. 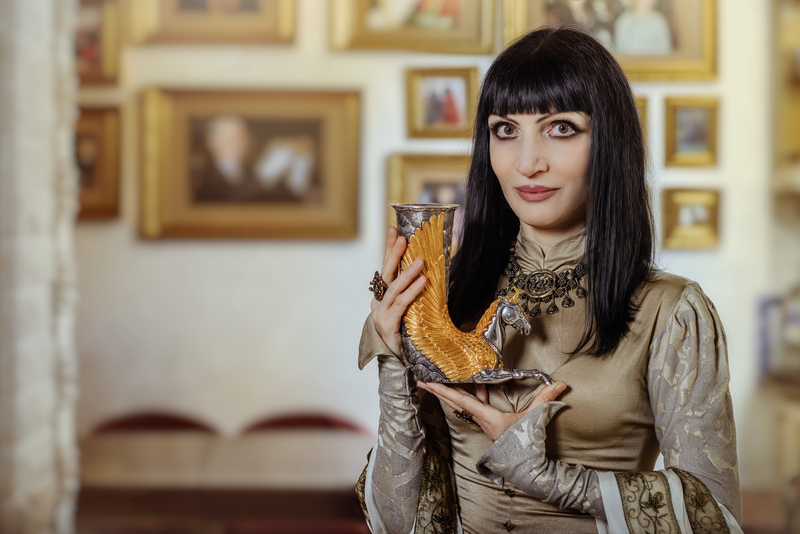 The rhyton of her work is stored within Vladimir Putin’s collection. Saida Panesh (SP): Several years ago you visited Jordan as a guest at the wedding of Ali bin Al Hussein, the son of King Hussein who invited you for creating a wedding dress for his bride. 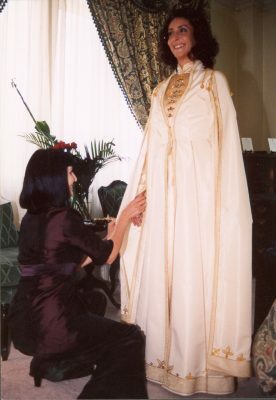 Why did the bride of Prince Ali bin Al Hussein decide to be wear an Adyghe national suit on her wedding day? Asya Eutykh (AE): The mother of the bride asked her daughter about it too. In fact both Algerian and Bedouin wedding suits are very beautiful. But Rym (the name of bride in translation means “gazelle”) in no case wanted any other dress. The point is that in the nineteenth century after the Caucasian War, six hundred thousand Circassians had been evicted to the Near East outside the limits of their historical native land. The Adyghe moved to Jordan and played an important role in the formation of the Jordanian state. The Adyghe people are treated with great respect in Jordan. The mother of Prince Ali, Alia Toukan, is one of deceased king Hussein’s wives; she is from their descendants. Queen Alia was lost in an accident when Ali was two years old. The huge airport in Amman ‘Queen Alia’ was named in her honour. That is why Ali Bin-al-Hussein is considered to be not only Jordanian, but also an Adyghe Prince. Besides, the image of Circassian on the Near East is the romantic knight. 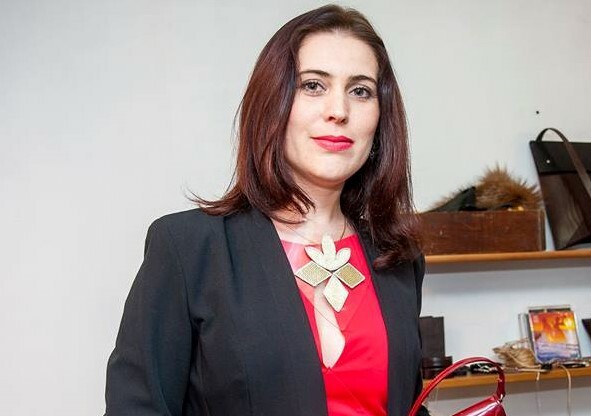 Prince Ali didn’t get married to an Adyghe girl, the father of Rym is a very famous Algerian diplomat, her mother is Croatian, the nanny Indian. Maybe they just wanted to surprise everyone. It is very difficult to surprise people today. Princes and Princesses are in the same situation. Whatever the true reasons were, it is very pleasant for me that during this romantic pre-wedding time Rym and Ali appealed to the Circassian culture. SP: Tell us, please about the wedding dress you have created for them? AE: It was made in Belorechenskiy style with Skifo-meotian elements. There is no gold embroidering on this dress, typical for classical Adyghe Sae (a female national suit). We made silver and gilt metal stripes and ten little bells instead. The newly-married couple enjoyed the dress very much. After the official ceremony Ali embraced me, thanking me with all his heart and said “T’haeg’apsow” meaning “Thanks” in the Adyghe language. I took all this strongly to heart. We practically had to make the dress without fitting. I portrayed Rym in a wedding dress, measured her and we went to Russia. Apart from my picture drawn in pencil the newly married couple had nothing. There are dresses which can afford some errors of calculation, but there was a dress from natural silk that does not stretch; but I corrected absolutely nothing. We brought the dress three days before the wedding and it looked to be an exact fit. SP: What kind of a girl did the son of King Hussein choose as a wife? AE: In the Near East, Rym is a very famous journalist. She is not of royal blood. Courageous. She was the last person who was driven out of Iraq during the bombardments. She is very nice, but I think that the main reason that attracted the true Prince was her sincerity. Ali has grown up without a mom, with a stepmother. He feels people very subtly and takes a liking sincerely, with all his heart. There is no conceit and arrogance in Rym. Before the wedding she gathered together all her friends from childhood. There was the Russian Natasha from Alma-Ata, Helen from BBS and her classmates and friends with whom she grew up from Croatia. In the wedding ceremony when we appeared face to face, Rym said: “Asenka, I love you so much! You are such a handy woman! Let me kiss you!” And she kissed my hands in the presence of all the guests! No other Arabian Princes will act like that! SP: Can you describe the wedding ceremony? AE: The official wedding ceremony was attended by only Imam and the family. There were Rym’s parents and brothers from her side. From Ali’s side there were: the King, Queen, the only sister of Ali by his mother, her name being Haia (“life”) and all the children of King Hussein (there are 12). There were no extraneous people. it was the wish of the newly wed. In general there were 300 invited without cameras to this wedding. It took place in ‘Panorama’, the most beautiful area near the Dead Sea. The castle is situated on a high altitude, the rocks storied by circles. All of Israel was clearly visible from this place. The magnificent tables were laid. Hundreds of white sofas were scattered like pillows on a terrace. Small little tables were situated before them. An observing platform full of guests was in the middle. On a skyline there was an unbelievable decline, all the colours of the rainbow. It was the true wedding of a Prince and Princess. SP: Tell us about your friendship with Prince Ali bin Al Hussein. They say he got registered in your apartment? AE: The first time Ali saw my works was in Cherkessk. The Congress of International Circassian Association was held there. After the event he came to Maykop to meet me, where he suggested making ammunition for his Guards. Next month was spent drawing sketches. Complete sets of Prince and Guardsmen weapons differ from one another as in the bygone days the weapon of the Prince differed from the weapon of Uork (soldier-nobleman). 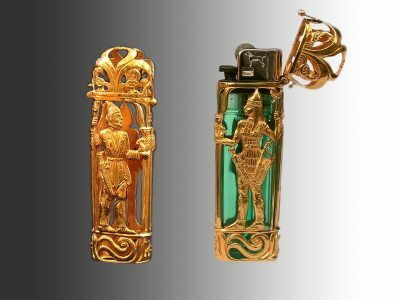 On a white background of the Prince’s cherkeska the weapon should shine like the sunny glitter of gold, on black background of the Guardsman’s cherkeska the weapon should flicker with the cold-lunar color of silver. Four months were needed to make 16 complete sets, processing 26 kg of silver. 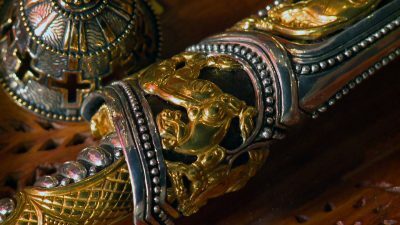 One complete set included gazyri, a belt with pendants, a special box for weapon oil, a dagger, a sword on a sword belt, a holster for a pistol and a small leather handbag for fine accessories. Ali often came into our workshop and saw that we worked until we were ready to drop. When you experience certain difficulties with the person you do not let him down; it becomes a strong basis for further relationships. Ali often wanted to be in Russia and when the question arose that he must have a residence permit, he said that he would register only at my place. We have been friends for six years. SP: Asya, you are both seamstress of gold and skilled worker of the weapon. The ‘seamstress of gold’ sounds female, clearly, but the ‘skilled worker of the weapon’, is a little unusual. How did it occur that you began making weapons? AE: Everyone has his own mission. Today in Adyghe there are a lot of examples when men are engaged in female crafts. Zamudin Guchev took weaving a rush, clearly considered a female job, to the highest level. Slavik Mastafov lives in Kabardino-Balkaria. He sews clothes and embroiders and does it better than any woman. In Georgia there is a man who spins laces. I consider: if the artist does his work from his heart it becomes alive, magic. And people feel it. I do not know why men are talented in female crafts, and the woman, in masculine. These are the Caucasian paradoxes. SP: From your point of view what is the basic use of cold steel? AE: Such a weapon is a thing for self-perfecting. When different people, who know nothing about the Samurai philosophy, take the weapon in their hands, they are seized with the same feelings. I checked it many times. Even if the blade is still being worked on, but already has a handle and when you can take it into your hands, a frost suddenly passes through your back. You begin feeling that you couldn’t be disorganised or not be serious with the weapon in your hands. The person with the weapon ought to be perfect. You cannot be ordinary, you ought to be another. But what kind of person can you be? And here the question arises. That is why it is considered that the weapon is a thing for self-perfection. SP: The jewelry article is small but creating it, as a rule, demands a lot of time. However, the depth of your catalogue shows that you are a very fruitful artist. How can this be? AE: There is only one tenth of all my jewellery in this catalogue. Really, I have made about a hundred swords and fifty daggers. I love my profession very much. Even on my Birthday or on a New Year I go to my workshop with a glass of champagne. For fifteen years I had no day off. If I have serious order, I am not able to sleep for a week. If the person is not born for Art, he cannot carry such a wild, heavy load. SP: Do you remember all the exquisite articles you have made? AE: The articles of Art have the ability to leave the world of the creator and to live their own life. The special feature of the jewellery articles is that they are eternal. I remember all of them. They are my children. But you cannot imagine what feelings I have when I happen to meet my work. Shooting a glance at it I can easily read its life by cracking and scratching, in a similar way to human wrinkles. SP: How does tradition correlate to modernity in your work? AE: When I make a functional thing, which one can wear, I certainly underline the most fashionable tendencies. For example if today female belts are fashionable to wear below the waist, on the thighs, I immediately find a lot of belts which were worn on the thighs in traditional Art. Such a thing will look up-to-date and at the same time, as if it is just from excavation. Fashionable tendencies exist even in the most ancient things. In the Art of Inks, Aztecs, and the people of Oceania, one can find such fashionable tendencies of Art as cubism, modernism, etc. It is impossible to invent something really new. Everything has already existed. 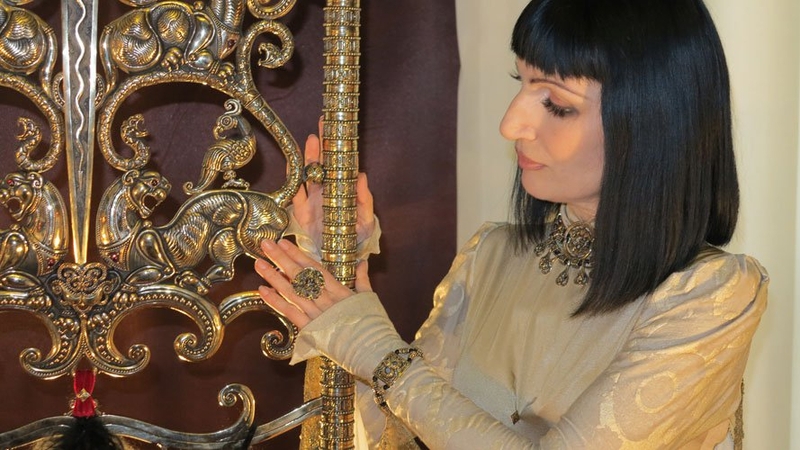 SP: What is special about Adyghe gold embroidery? AE: There is a certain set of techniques in the Art of embroidery in gold known by many people. The Slavs, Turks and the Arabs have needlework, a satin-stitch and weaving. The main difference of the Adyghe gold embroidery is a special thoroughness of work. Let us take for example the Algerian gold embroidery. It is little bit careless, as is the Daghestanian. Adyghe gold embroidery is very accurate. It astonishes me how ancient masters used a material, design, and quantity of an ornament and how they disposed it on a dress. The similar gold embroidery is a Turkish tradition. The Adyghe people though used to embroider small things; the Turks embroidered in gold huge carpets and coverlets. SP: What symbolism underlies Adyghe ornaments? AE: Since Maykop culture, dating 3-2 thousand a.d, a rich decorative set was developed from the totems of animals, the talismans (mascots) and magic signs. Then there was a blossoming of Meotian-scythian culture, the so-called animal style. Then at the turn of the century the animal basic of ornaments passing through antique time, the Early Middle Ages and Middle Ages was gradually allayed, animals have turned to a linear ornamental image and in this form it came down to the belorechenski style. It has enough ornamentation of the animal style. Finally, the Adyghe ornament was formed during last 500 years. Today it is presented by patterns, which are original ‘vestiges’ of animal elements such as little birds, horns of muttons, various tendrils and ‘tamga’, or family symbols. SP: Do you use magic symbols in your works? AE: For many years I worked on the understanding of ancient Adyghe magic symbols. Apart from the world outlook in the masterworks, it also reflects the special power (energy) expressed by author’s signs, or so-called ‘magic symbolism’. Each image is not just a chance phenomenon, and there is no little tendril in my works that is just simple a decorative element. SP: Why were Adyghe people called ‘fashion-makers’ in the Caucasus? AE: There are only five classical types of dress that exist in the world. The Adyghe male national suit, cherkesska being one of them. Russian tsars didn’t disdain wearing it. Nicholas II liked to wear cherkesska on celebrations and ceremonies. It was borrowed and dresses with pleasure by many other peoples such as the Georgians and Azerbaijanis, as well as the Cossacks and other people of Northern Caucasus. Today one can meet the men in cherkesska at a courtyard of the Jordanian King Abdalla. Cherkesska implies a certain model of behaviour. It is difficult to imagine the man in cherkesska that would sit careless, having a pot-belly or being overdrunk. Adyghe people sewed the suit strictly, laconically and exquisitely. It is refined, not overloading with superfluous details. Our national suit is not vulgar, only one or two colors with the third additional are matched strictly in it. It is a suit of Renaissance. Very similar suits were in both Italy in Russia as well as all over Europe. But under the influence of time this suit in other countries has changed, but in Circassia by virtue of the historical circumstances and remoteness from large cities, it was fixed and taken to its perfection and in this form it came to nowadays. If there were no Caucasian war and all these 150 years the basic ethnic mass of Adyghe people would live on their historical native land by a normal humane life the suit of course would too be changed. 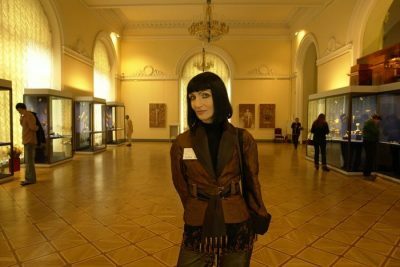 In Krasnodar Museum there are the pictures of the beginning of the 20th century. One can see the representatives of rich princely families in national suits. The small handbags and laced handkerchiefs are at the women’s hands. The suit itself has a sleeve with little frills. On a sleeve pendant it appeared as a suspension bracket with asymmetric flowers; it is absolutely uncharacteristic for classical Adyghe Sae (Women’s dress). 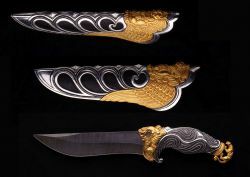 In Daghestantanian Weapon Art this style has the name ‘Moskov nakysh’ (“bouquet of flowers”) or ‘Moscow style’. SP: Tell us about your roots. Who are your parents? AE: I am the representative of the Eutykh family. My grandfather Eutykh Tsikuzhy was the smith. But, unfortunately, he died before my birth. My grandmother Kadyrhan Pak – was a well-known seamstress of gold. Previously, every Circassian girl must sew herself a wedding national suit. It is very intricate work, not every girl was able to do it. But in my childhood I had several suits of this origin. When I grew up, my grandmother had shown me how to cut out correctly and how to embroider ornaments. 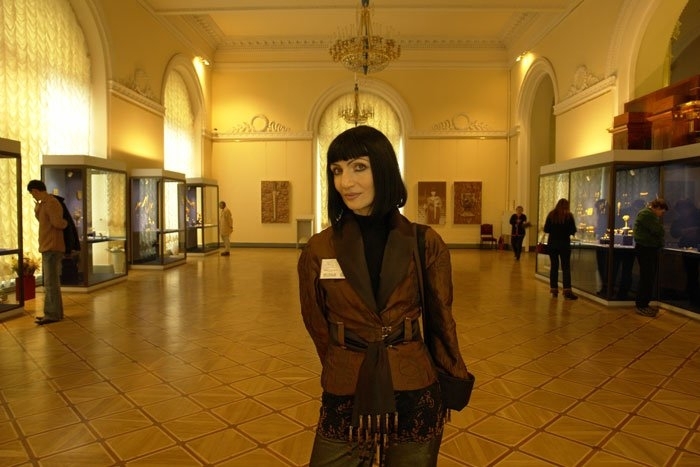 My mum Fizh Mahmudovna Andruhaeva – is a medical woman by education. She had worked as a doctor for eight years on boarder ships ‘Sannikov Strait’ and ‘Krusenstern’s Passage’. She travelled and told me interesting stories about the distant countries. Mom has a strong personality. I think I have inherited my character from her. Daddy Aslan Tsukovich had a PhD in Economics. He was a general director of an Argricultural firm ‘Adygmjasprom’, but the last years of his life he devoted himself entirely to religion, the qady of the Republic of Adygea, the Krasnodar and Stavropol Territories. Daddy left this world 6 years ago and I suffered a heavy loss. SP: Where were you born? Tell us, please about your childhood? AE: I was born in Urupsky rayon of Krasnodar Territory (today it is Novokubansky rayon). My family moved there because my dad was sent to work as a livestock expert. I was born in winter. It was deep snow. Father brought the sledge and took my mom to the centre of rayon to the maternity hospital. Riding through the Kolosovo fields (that year the archaeologists excavated Kolosovka – a grave, in which a Scythian priestess had been buried) and our horse Mayek beat with his hoof. “The spirit of a priestess let out, I wish it will not remove into our child” – my father had joked. I grew up on fairytales. My grandmother was a storyteller. I knew all the heroes and heroines of the Nart Sagas. I tried to imitate them. My favourite female images were Satanaya-guashe and the golden-armed woman Adiif. According to the legend Adiif lighted the way home to her husband with her golden arms into the sea instead of a lighthouse. SP: Where did you acquire your higher education? AE: First I entered the Artistic, Graphical Department in Karachaevsk, and then I was transferred to Kuban State University. I received my diploma there. But I never did my studying through the simple attending of classes. The favourite proverb of my grandmother is “The value of your head is in what your eyes have seen.” I have learned from many famous talented teachers in Daghestan, Riga, Tallinn; they are: Bedzhanov Yuri Karabatirovich, Titov Victor Ivanovich, Beda Georgy Vasiljevich and Magamedov Kurbanali. My visiting cards were not the agreements between educational establishments but were instead my drawings. I came to a new place and told them that I want to study this or that artistic skill and then I sat among the artists and painted. SP: How did you meet your husband? AE: The Agyghe word ‘psil’ih’y’ (fiancé) doesn’t mean very close relationships. Everyone can come to the girl’s house with a visit and get acquainted with her. This communication doesn’t bind you much of course, until you consent to marry. When I became famous when the exhibitions, TV and all this began, the crowds of such devotees rushed to me. I lived in the centre of town on the first floor. The crowd of young men could visit us, and sometimes it was difficult even to understand who the fiancé was. I saw all these comings and was waiting but people all around said ”This Asya is too picky!” Many men took offence. I refused many. There was not this ‘something’ that one can name ‘love at first sight’. But one fine day the famous Circassian poetess Muliat Emizh came to my place and saw in my workshop the book written by Elena Blavatskaya ‘The Secret Doctrine’ that was very rare at that time. Mila told me that a new guy came to work on TV and she saw the same book in his hands. Then she called me and said “Asya, me and Rouslan are coming to your workshop!” I have always thought that the day I met him something special had to happen. For example, the thunder had to roar from the heavens. The most interesting thing was that I had no presages. I dressed up and I came to the workshop with a great unwillingness. But when I came up and opened the door and I saw his eyes… All became clear. For me the hand of a man is of great importance. Not the outward beauty of a hand but when you take someone’s hand and know this man is the ‘man of blood’. He held out his hand to me, simply pressed it and an inner joy appeared inside me for I had met him. All was easily beautiful and natural. We got married in February in Maykop. On the day of our wedding the snow fell in thick flakes and a thunderstorm roared. But then a huge rainbow appeared in the sky. Old local residents said that it was the first time this had happened. But I had clear signs all around. Rainbow is my sign; it has escorted me all my life from the day of my birth. SP: What kind of dress were you married in? AE: I got married in an Adyghe Sae. I sewed my wedding dress myself. SP: Tell us about your husband. AE: Rouslan is unique. He knows everything, he likes to study and always absorbs a lot of new information. He is keen in Astronomy and Astrology. As a child he was very gifted in Mathematics, Physics, and was taken to Moscow to a boarding school for talented children under the Moscow State University where both children from the krishnait’s family and those of hereditary scientists studied together. Then he entered the Moscow Aviation Institute in the Energy Department, receiving the title of Engineer in Robotics, later returning to Maykop. But there was not even one robot in the South of Russia, so he began to work in TV. Twelve years passed from the time we met each other before we were married. Together we shared the secrets of unique ancient technologies, investigating books and archeological ceramics. We never work separately, being together twenty four hours a day. Rouslan supported me very much both morally and professionally. He always invents some fantastic adjustments which facilitates our work on the basis of the latest scientific technology. SP: How it is possible for two creative people to live together? SP: From your point of view what is the main mission of a woman? AE: To be a good mother and wife. The simple woman’s happiness is not comparable with other professional happiness. I have to make a sacrifice in most cases. I have two sons, Zaur and Beybars. I remember such a story. I had a huge order and in the literal sense of the word “I crawled out” from my workshop. Zaur sat in the room and was playing on the carpet. I began to tickle and play with him to rest myself for a while. And then Zaur asked me fearfully “Mom, are you playing with me?” I asked him “And what?”- “Mom, I never saw you playing with me.” I was terrified. God! My child never saw me playing with him! After that we decided that every weekend we would spend it with our children, but it doesn’t always work out. Unfortunately our children grew up without the Narts Sagas, without fairytales. But my advantage in comparison to other working women is that I don’t go out of my house to work – my workshop is at home. Our children can always hear what we are talking about. This has undoubtedly affected them. Zaur studies at the fourth form at school for talented children and has already become famous. His teacher is afraid of saying something about the Solar System, Outer Space or Astronomy in his presence. He is a great expert on the atmosphere of Jupiter. SP: What are your creative plans for the future? AE: Not so long ago we worked with the London Gallery of Contemporary Art. It supports and popularises different talents in the field of Fine Arts. The London Gallery is engaged mainly in painting, but Jewelry Art demands special showcases and reviews. Now we are working on our new catalogue and are going to open our own gallery. We are making three collections that will move from hall to hall. It is very convenient. We have a lot of invitations and want to start exhibiting in Tel Aviv. We have an invitation to arrange in Hermitage. I am very glad that Art provides an opportunity to talk not only about the war in North Caucasus but also about the unique Caucasian culture. As the picture of the world from earlier times comes to us inevitably in fragments, our articles as the definite communicative signs are able to tell us about the inimitable culture of the Adyghes and the philosophy that existed and exists today in our people. SP: Who are your Art dealers? AE: Victoria Kozlovskaya and Albert Saralp. They work only with me. We have been working together for three years. SP: From your point of view what can help in the development of Circassian culture? AE: From my point of view, the development of one ethnic minority helps the dynamics of development of the whole powerful ‘Mother Russia’. Every folk has its own truly talented people; if one can pay attention to the talent at the time that will affect the cultural development of the whole ethnic group. One man – is man. On first sight, the Adyghe people have few famous artists, but we have them. Nowadays there is practically no discussion about the painter of world importance, Felix Petuvash. But all the Narts Sagas are in his pictures… Few people can read these Sagas in the Circassian language. But if someone goes through the pages of Petuvash’s catalogue, everyone can make a parallel to the ancient Greek Sagas. Knowledge is the main process of development. The supporting of really talented people will facilitate our young generation who will not absorb the artificially made product in the form of so called ‘American culture’, but instead take an interest in his own ancient roots. SP: What is your attitude towards critics? AE: If one can have a right attitude towards critics it can be helpful in his development. We treat critics with gratitude. Our friends and those people who appreciate our work admire it but there are some people that notice each weak point and at the same time they point out the defects with this. So we can understand what side we must work out better. SP: Do you have any pupils? Are you going to open your own school? AE: Higher education cannot give everything in Art. After the high school the person has to learn by working ‘in the material’. As a rule, children that grew up in workshops have more advantages than those who just went to Art school. I am responsible for my sons. They grew up in a workshop, one cannot teach them. They drunk in many things with my milk. But from there will appear a very gifted child; I shall of course not refuse to help him. AE: I think there are people either born with inspiration. or that inspiration is a gift from God. Even if I very am tired the second wind opens in me. And I don’t know what leads my hand. Maybe there is an objective necessity in the North-west Caucasus that is based with campaigns of skiffs, the crafts of meots, kosogs and zihs – the ancient tribes whose secrets we have lost now, appearing as an Artist who has summarised the richest ethnographical and archeological material in his creation. The excavations of the Uliap Maykop and Kelermess burial grounds, where hundreds of unique articles of ancient masters were found, has told the world that the Adyghe Land breathes with creation. But I demonstrate nothing to none. And I impose nothing. With the help of my Art I try to reflect the subtle connection of time ties and to show that everything has its roots and they are growing and developing in the tree of human life. Next post Open letter to Sibuor, descendant of Kenyan soil!